[Around 2:45 p.m., Sunday, Nov.10,] Lancaster Station Deputies responded to a home after they were told two children were in danger. The home was located on the 1600 block of West Avenue L in the city of Lancaster. Deputies contacted the resident, suspect Patrick Ybarra at the front door. 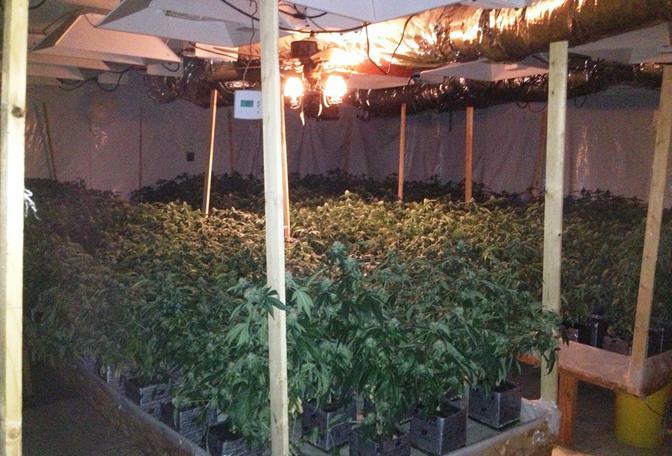 They were given permission to enter, and after further investigation while looking for the children, they discovered 326 live marijuana plants and an elaborate hydroponic system for cultivating marijuana. Mr. Ybarra’s brother, suspect Robert Ybarra was also detained and questioned by deputies. Detectives estimated the entire seizure weighed about 200 pounds and had an estimated street sales value of $400,000. Both suspects were arrested and transported to Lancaster Station Jail. They were both charged with possession of marijuana for sales and cultivating marijuana, with additional charges pending for possible theft of services from Southern California Edison. The suspects were held on $50,000 bail. The children were not discovered in the home, but were found in a safe undisclosed location with a family member. 50 comments for "$400K worth of pot seized from Lancaster grow house, 2 arrested"
these guys knew what they were doing look at the amount..and it is probably a family ran operation with multiple houses. Thank the person who had courage to do the right thing…A deal could have gone bad and kids could have been caught in the middle..happens all the time people. and yes it is CHILD Endangerment. That is why they got arrested. They both have under aged kids from what I found out about them. jail is where they belong. to all the pot heads out there… it only makes sense in you messed up world’s! @John Doe…shame on you for trying to change the focus from the real idiots! and did you just seriously say that? Well then… thank God for crazy ex girlfriends!!!! regardless of what you say about this woman, wrong is wrong! how about focusing back on the illegal activity these two low lifes were doing….. if they were not doing anything wrong they would not have been in trouble!! FYI….. when there is criminal activity occurring and children are around…. it is child endangerment!!! You obviously didn’t read the section about the mother being so wasted she allowed her 3 year old daughter to wonder around the street. It becomes my business when I have to support this type of person with my own hard earned dollars because they refuse to work. That little girl could have been killed had I not seen her walking around. If you want to go do whatever you you want to your body, fine go do it. Away from me. Where I don’t need to support you, don’t need to deal with your BS. When it is all said and done, it is people like me who have to clean up your mess. Far better chance that the “wasted” mother was using any of a number of other drugs. I could be wrong, did you drug test her, or just assume? When I walked into her house, it was more then obvious that she had been smoking pot. This is also a family we have had problems with in the past where they were growing pot in containers in their front yard. Could she have been using other drugs as well? Yes, but the evidence points to marijuana being her drug of choice. I am so very tired of people ranting and carrying on about how the police should leave pot users/growers alone. It is ILLEGAL and until it isn’t they are doing their assigned jobs. 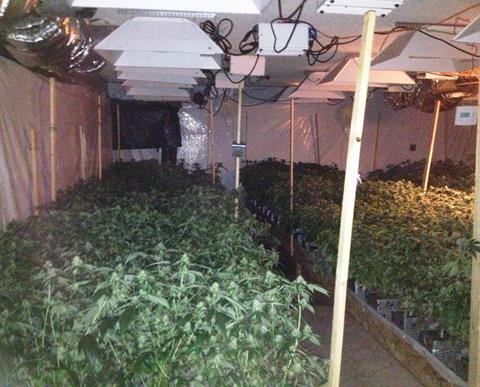 And that many plants, you cannot tell me it was for personal use. That was big time criminal activity. The amount of electricity to run that operation was probably siphoned off illegally. I work in a business where I see habitual users of put on a daily business. Many (not all) are on SSI, refuse to get a job for “emotional distress” or””mental anxiety”. Heck I had to walk a 2 year old child home to her mother because her mom was too stoned to care that the child had wondered off. And yes I called child protective services. This was not the first time it happened. I have found pot plants growing “free” around the property,because the person growing for personal use was too lazy or just plan careless to keep everything contained. Any child could just come along and ingest it. Thankfully most kids don’t eat random plants but even if 1 very curious child did and had a reaction, I find that very negligent. These examples might be extreme, but I see this kind of crap on a regular basis. People like you belong in a communist country always trying to dictate what others can and can’t do just because it’s against the Law it doesn’t mean that the law is right why don’t you mind your own dam business and let people do what they want to their own bodies. I love how people think this just took away from people who would be cured from diseases and cancer. Yes it can help with the side effects of cancer and there are legal ways of going about it besides growing it in your house! How about catching some real criminals and leave the herb farmers alone!! I agree I live in Oregon but i was born and raised in Lancaster I think they need to worry about all the gangs, heroin and meth problems. leave our growers alone they aren’t hurting anyone. Ridiculous statement. MOST people who are pot smokers dont move on to harder drugs, sure, some will. But I am also sure that marijuana wasnt their first drug to try either. Drinking and smoking cigarettes are. But that isnt always true either. Dont lump everyone’s experiences up. You should do some research woop woop… Marijuana does a lot more good then bad. Your another one of those sheeple that don’t do [removed] but what the news that is run by big government. I agree the scale of witch they were operating is a bit excessive but at the end of the day drunks kill more people than marijuana has or ever will ya [removed]! With that attitude, I bet you are a cop, your attitude makes me want to set up shop for the hell of getting away with it, I already have a GOD thank you and you are not him! Considering I have tried to make myself smoke the stuff for the health benefits (my mother died of bladder cancer) but can’t seem to keep it up, as I really don’t like the feeling, kind of pointless for me, don’t ya think? laws they are enforcing or do they just act never think twice? Getting pulled over used to involve a friendly chat, now it is an interrogation, this world is going mad!! to Robert how do you know it was not a bitter angry old pathetic ex wife who was so desperate to get back at her cheating spouse!!!! You’re absolutely right especially for cancer patients. Imagine how many people that could have cured, lives saved…. And just how many people are cured of Cancer by weed? And just how many people are killed by cannabis use? Lol… yes legalize it and get rid of the chemicals used to mass grow it. Kick it old school with dirt and water. There are legal ways to grow. Perhaps these men should have looked into it instead of growing in an illegal way. I have multiple friends who legally grow for medical distribution. Cool, please post where they are located so the public will know where to go for their cancer cure. Why do you keep saying marijuana is a cancer cure? It’s not!! it is used to help with the pain and ill feeling from the drugs that help battle the disease. Pot does not CURE cancer. All it does is make it easier to go through the therapy and ease the pains. The pot itself is not at all a cure. Anyone with a medical card can set up their own grow for their own use, legally. This amount could in no way be considered for anyone’s (except Cheech/Chong, Bill/Ted) personal use. The thing is, most people who now have MM cards are too much of a slacker to even be able to grow their own. If they, and other medical patients, had their recommendations up and ready for a cop to show then yes, they could have that much. But that would take quite a few patients. All these people had to do was get a permit to grow if they were legal. 326 plants does not equate to 400k in revenue… I love how our wonderful law enforcement try’s to exaggerate the money involved in a grow… Smh make it legal already, I don’t use marijuana but alcohol in my opinion does far more damage to your body and others when consumed….. Tax it and call it a day! James, I have to agree with you. If they would just legalize it, look at the jobs it would create and the tax revenue for our state. Alcohol is a lot worse, besides, there would be an increase in snacks too! Its a win – win situation, but if it is too easy to fix our government will not entertain the idea.. Many pharmaceutical companies and prison unions fight, and donate money towards keeping marijuana illegal. When law enforcement weighs the cannabis, they weigh every bit of plant matter down to the roots, including leaves and stems; and they weigh it wet. The actual harvested amount would end up being way less. Perhaps 2 oz per plant, or about 20 something pounds all together after it is ready for use. So, it is far from $400k worth.